Scoop the onion into a strainer, rinse under cold tap water, shake off the excess and transfer to a medium bowl. Add the green chile, tomatoes, cilantro and lime. Stir well, taste and season with salt, usually about 1/2 teaspoon. Cover and refrigerate until you are ready to serve. Not working right now so have time to cook more. 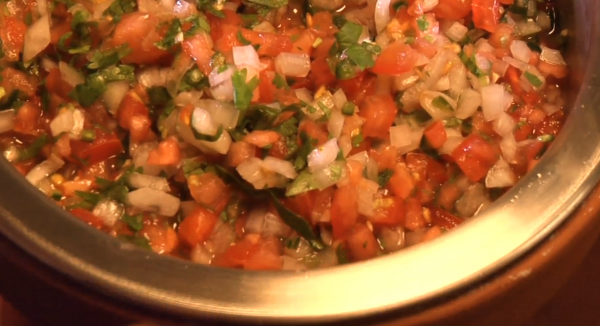 This was a quick and easy salsa to go with my Rick Bayless Carnitas I made. Dinner is great! Gracias! I didn’t see this authentic recipe in my books. This is what I want; plum tomatoes as they use in Mexico. Can you estimate the weight of “1/2 Medium Onion”. I’m converting everything to weights because of the differences in sizes of produce seasonally and regionally. Garlic cloves have a huge variance. Rick is a great TV personality and teaches so well. We call a medium onion 6 oz, so half would be 3 ounces! why would you rinse the onion, doesn’t that kill the flavor of the onion. Not entirely. We’ve found it mellows the onion’s strong flavor but doesn’t kill it. We do this too at home. We always watch One Plate at a Time with RB! We live in Chicago and each time we passed by Frontera in downtown Chicago, my hubby, who himself is a good cook, would wish to see him in person and tell him how he admires his Mexican cooking and his outdoor kitchen! Yep, outdoor kitchen! His dream! So it will not overpwer the salsa. It also works great in guacamole. Are there instructions anywhere on this site for canning salsas? I think you are supposed to cook the salsa a bit before canning it, even if the salsa is a non-cooked one. But I’m’ not sure. Canning (hot water bath or pressure) can be dangerous from a food safety perspective. Better to stick with recipes developed with review from thermal process authority experts, like those in the Ball Canning books. Then don’t deviate from the recipe.